I can’t believe it’s already the end of January! At this rate, 2017 will be here before I know it:0) But before we jump to far a head I wanted to share another naked cake for you today. This one is chocolate on chocolate and topped of with even more chocolate. 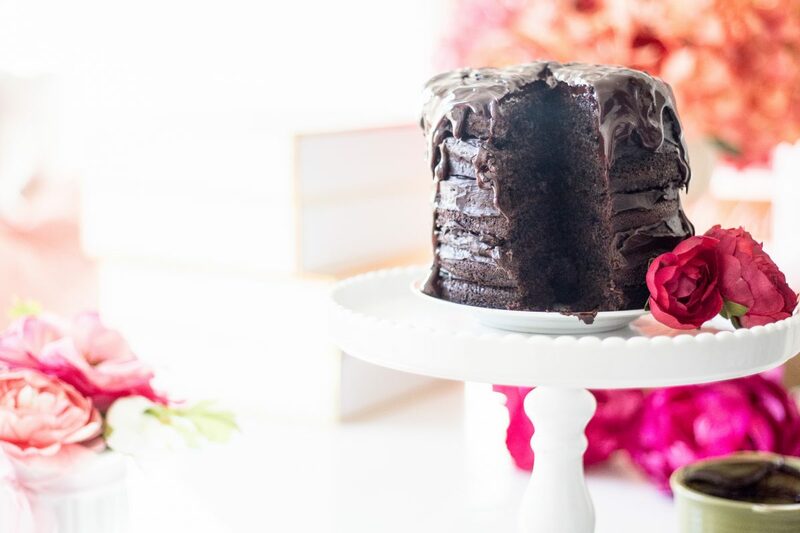 So needless to say, if you’re a chocolate lover, then this one is for YOU! I’m thinking your man will melt if your pulled this bad boy out of the fridge on Valentine’s Day! 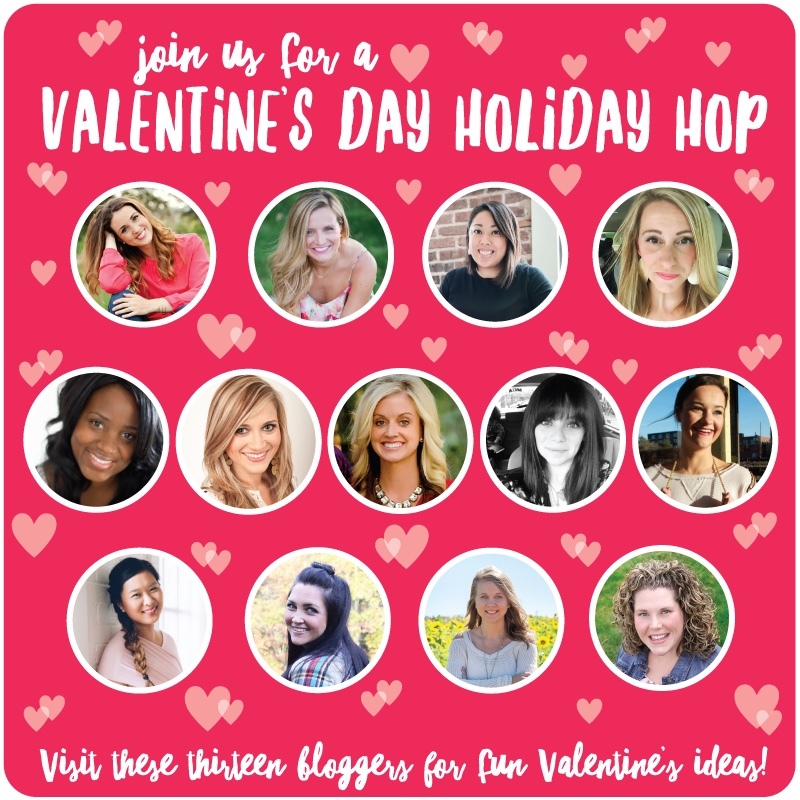 Not only that you can find a few other Valentines Ideas along with some pretty sweet giveaways! 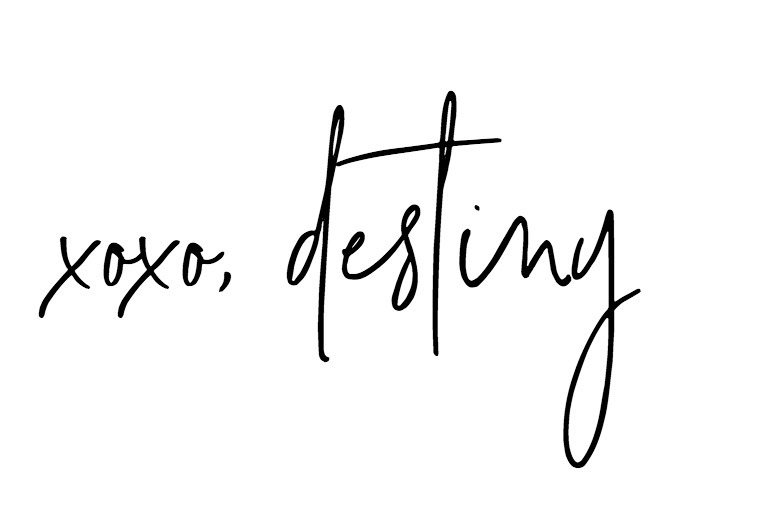 Just follow along at the end of this post! I have a full tutorial here for you on how to make naked cakes, but for now I will give you a small step by step on how I put this cake together. First I used these pans from Wilton to make a smaller size cake. Since this is technically a cake for two, I wanted it to be smaller. But honestly, it’s just as big as a full size cake, just a lot taller. 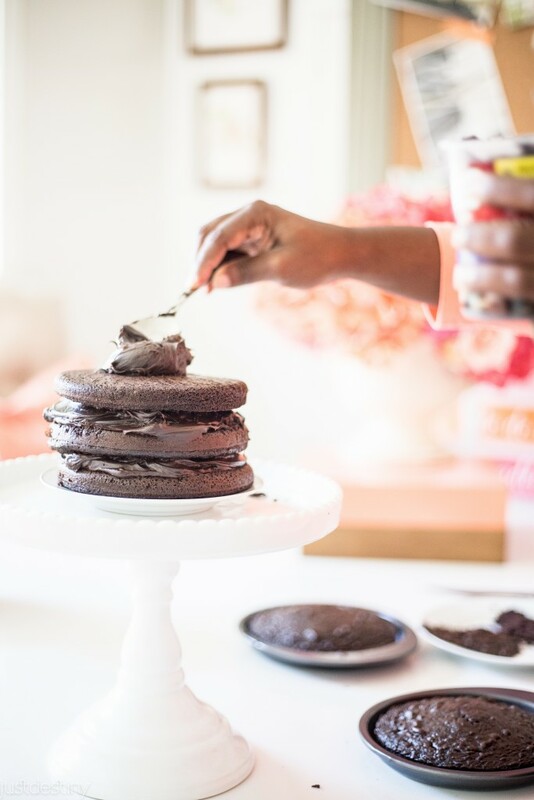 When it comes to naked cakes, layers are where it’s at. 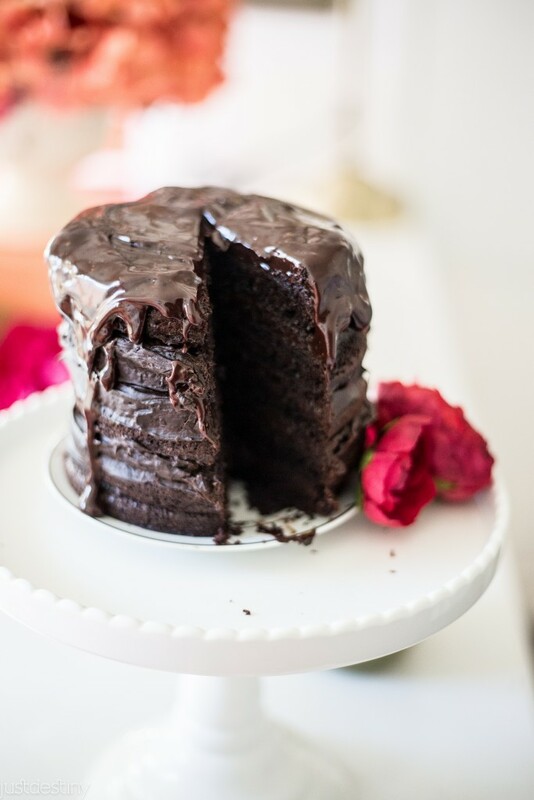 1 cup of chocolate ganache. Bake the cakes as directed and let the cakes cool completely. I ran errands and came back and they were good to go. You can even wrap them up and freeze them if you like! Then take each layer and cut of the humps. We need a level layer to stack them up nice and neat. Then place the cake upside down onto the plate. After that begin to layer. Cake, frosting, cake, frosting, cake, etc. And poor the ganache over the top. Check as you go to see if the cake is even. Get on eye level and adjust each layer as needed. Use the most level side as your top each time. Use a generous layer of frosting. 1/2 cups or more on each layer. 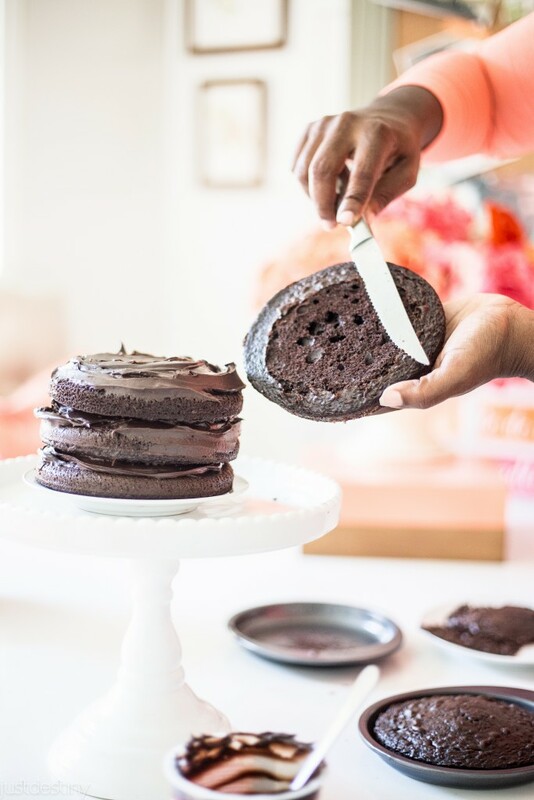 If things seem to be melting or if your cake is shifting and sliding then its to warm. Remember let your caked cool completely. 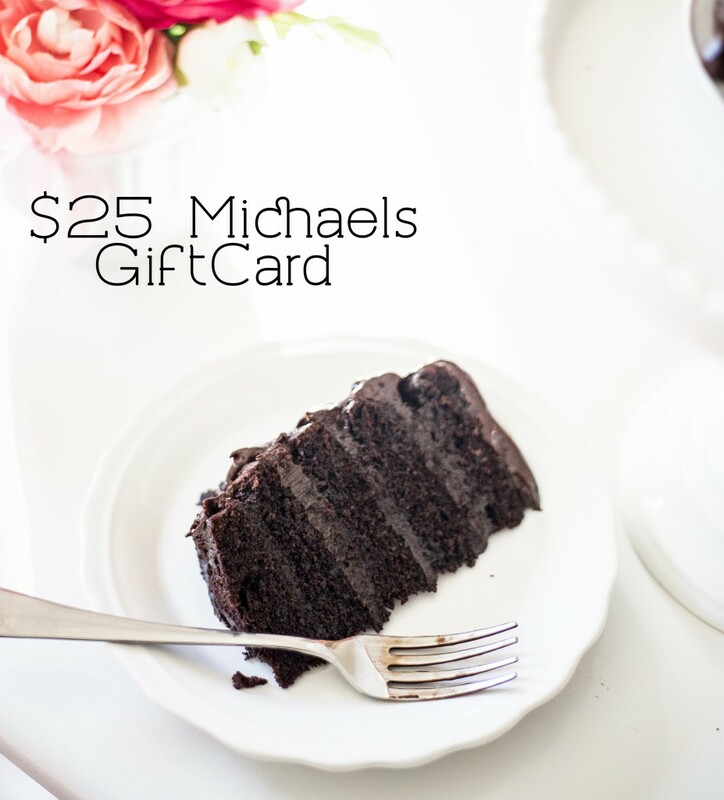 To help you make this yummy cake I’m giving away a $25 Michaels gift card so you can get your own 5 layer cake pans and more! That way you can get your naked cake on! 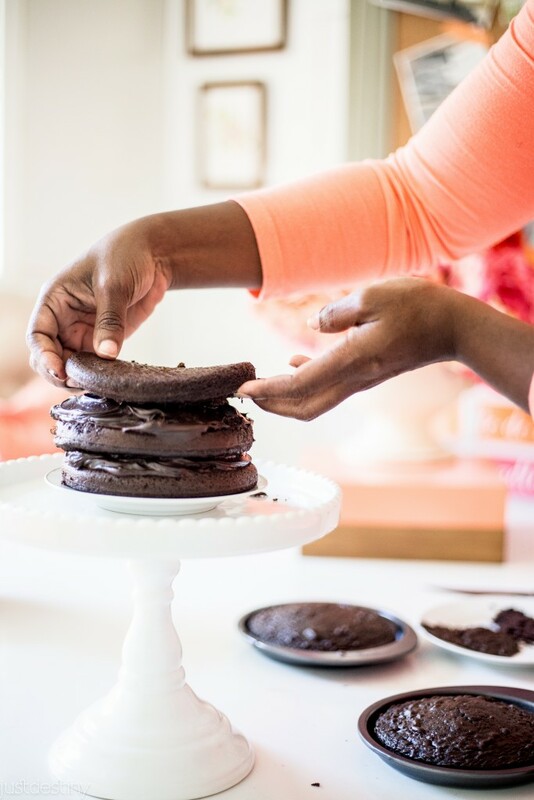 All you need to do is leave me a comment below talking about naked cakes. Do you love them, hate them or don’t get them? Check out my other friends and enter their giveaways too!!! This naked cake looks delicious! 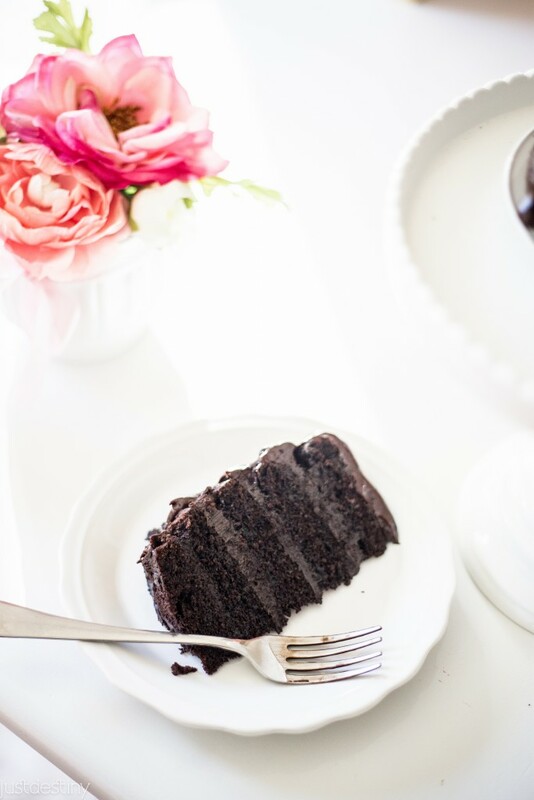 All the goodness of a chocolate cake without all the extra messing icing surrounding it! I’m sold!! I love naked cakes! I think they look so elegant, and simple. i am totally drooling over here!!! I do love them! 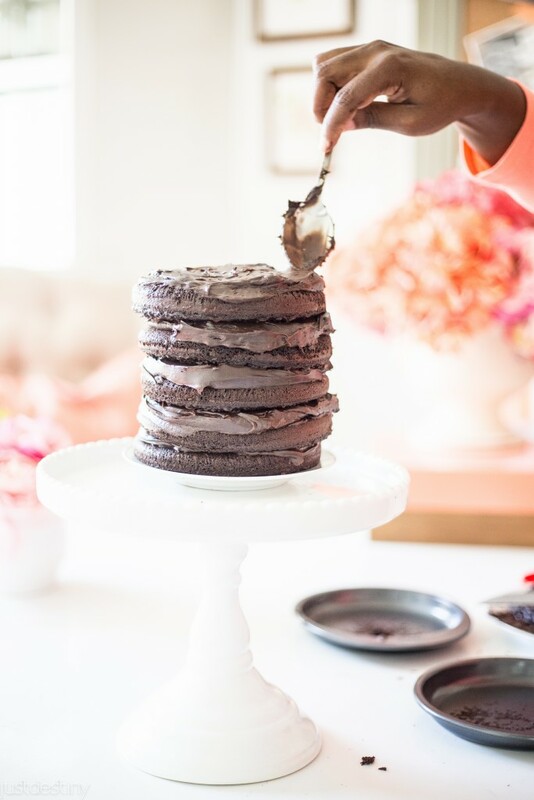 Sometimes there is just too much frosting…so I think its a great way to get the great frosting in a good combination with the cake! I love your 5 layer! So beautiful! This looks amazing – who could possibly dislike a naked cake? I love it! 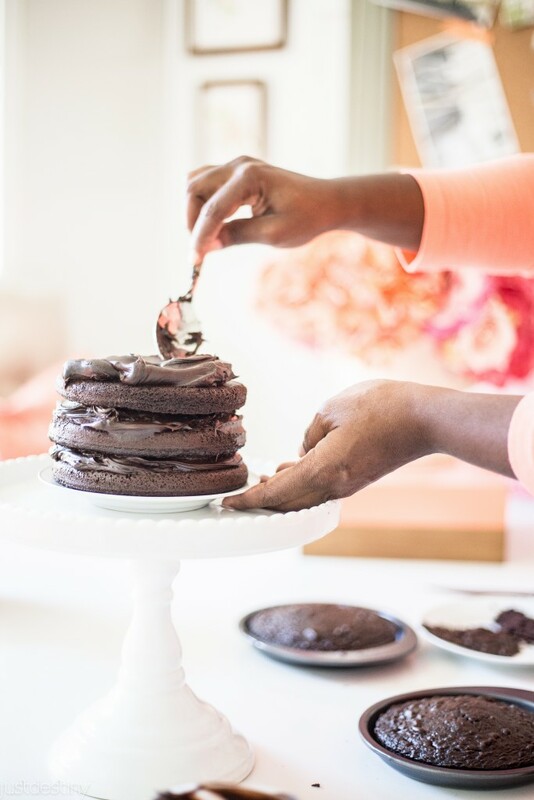 My fork doesn’t count calories when I’m digging in on a slice or maybe 2 of a 5 layer naked chocolate cake. Yummy! I’ve never heard it called that before but it looks delicious! I’ve never tried one but I guess I need to try. Looks so good and I love chocolate. I’ve never had a ‘naked cake’, but always admire how delicious they look! I had never heard of them until recently I saw some things about them on Instagram. I’m still a little unsure of them but would love to give it a shot and try to make one! I’ve seen some turn out SUPER cute! I love the idea of a “naked cake”!!! !It looks delish, and much less messy than a normal cake. Of course sometimes those are the best. YUMMY!!! I am a chocolate addict! I’m ashamed to say…the first time I saw a Naked Cake I was not a fan. I guess I was used to cakes looking a certain way, and it just threw me off a bit. Though I’m yet to taste one, I have to say, I find them more and more appealing visually. They are gorgeous! I’m thinking of trying my first in a few weeks for my little guy’s second birthday party! Thanks for the tips!!! 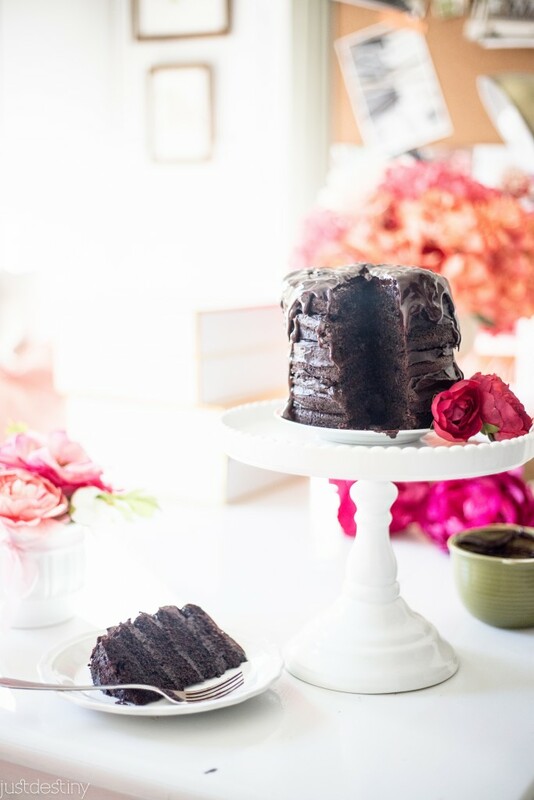 I love the look of the naked cake…it’s less work! I love naked cakes and yours looks delicious! They’re less “fussy” than the fully frosted ones… and I really, really don’t like the fondant ones. So pretty! 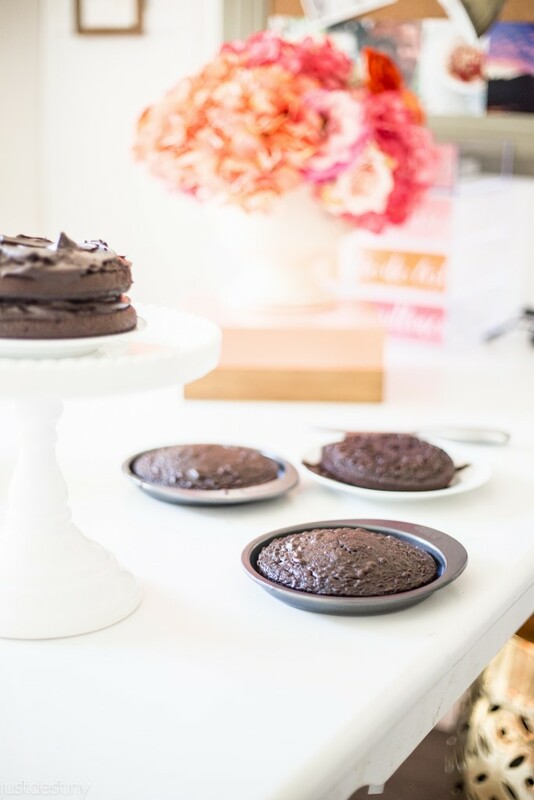 Where did you get those cute little cake pans? They are so tiny, but the perfect size. I gotta have some! Naked cakes love how simple it looks and you use a lot less frosting. Thanks for sharing. Love naked cakes. They are stunning! I’ve never tried one yet, but it looks soo good. Looking forward to making one. That cake is making me hungry! It’s gorgeous. I’ve made a couple of naked cakes recently and love them. This one looks really good! Yum, yum and did I mention YUM!!!!!!!!!!!!! That cake looks like a work of art. I’ve only made one naked cake but love ’em. I’ve never had a naked cake but I just printed the recipe so I can try it. Thank you! I’ve never made one before but this looks so yummy! I like the naked cake especially with the layers. It looks delicious! I think yours looks great. 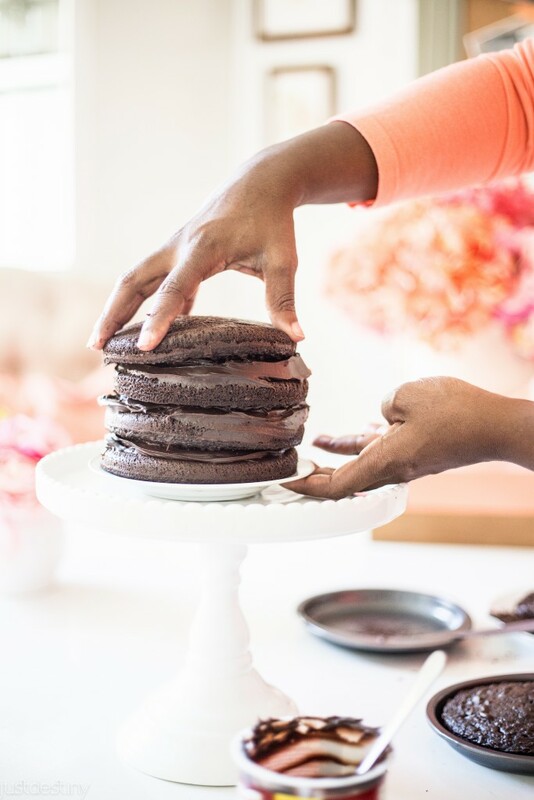 Some of us rely on frosting to cover up our baking mistakes, so I wouldn’t try making naked anything! This is my first time hearing of a naked cake and I like it. I adore a naked cake. They seem much less intimidating and taste just as wonderful as a fully frosted cake. Yours looks amazing! Looks absolutely delicious!! I love the trend of naked cakes and how they are growing in popularity! They look so fancy and involved but this makes it seem more manageable. Great tips – thank you! I can’t wait to try this and gift some on Valentine’s day! I like naked cakes, this looks so yummy! I have never tried a naked cake but it looks amazing. Yes I love all CAkes! I love them….I like things that are simple and delicious and perfectly not perfect! Yummmm!! Naked cakes are such a fun twist on a traditional cake, such a beautiful job you did! I <3 naked cakes! YUM!! I have never had one.. but I need to make one asap.. I am drooling on my keyboard. That looks delicious!